6 Different Water Bottles That Will Help You SLAY Your ‘Drink More Water’ Resolution! It sounds crazy but I really really struggle with drinking water still. If you’re rolling your eyes and saying “Tanay grow up!” then you’re absolutely right, I need to LOL. I started way before the new year, but one of my resolutions is to drink more water and to cut back on sugary drinks. because I literally can drink soda and juice ALL DAY. I’m a visual person, and it’s probably just me being extra but I feel way more motivated to drink water when it’s in a cute water bottle and I actually drink more that way. Bottles that have straws are usually my favorite but they have so many different cute bottles now that it’s fun switching it up from time to time. 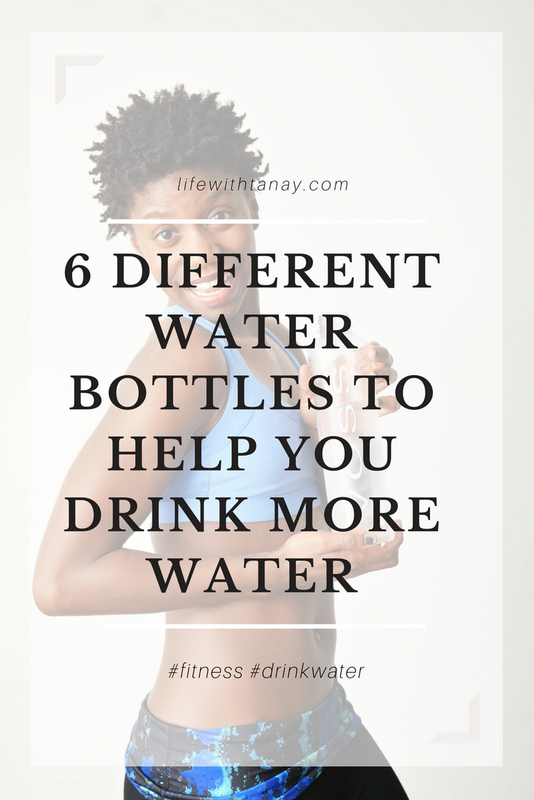 No matter what kind of water drinker you are, there is a bottle to fit what you need. Check out some of my favorites below. This bottle is my favorite. It’s 30 oz and has the time markings on one side and this quote on the other. I like the time markings because it let’s you know where you should be by a certain time of day. Pretty cool, and comes in different colors! Click here to get it on Amazon for $17.99! This bottle is probably the most pricy on the list but for good reason. If youre always on the go and you REALLY need reminders this bottle glows to remind you to stay hydrated and it can sync via bluetooth with your smartphone. Compatible with Fitbit, Apple Watch and other activity trackers. Click here to purchase on Amazon for $54.95! I’ve honestly never heard of this brand of water bottle but it’s the Amazon’s Choice for sports water bottles. It has over 3000 reviews and a 4.5 star raring so my guess is, you cant go wrong! Click here to get it on Amazon for $21.95! I just thought this was cute LOL. Because it’ll look like you’re REALLY into whatever you have going on. Isn’t that the point at the gym? Click here to get it on Amazon for $18.91! There are some days that I feel like I just cant drink water. Infused water is a great way to get your water intake but add some flavor to it without completely defeating the purpose and adding artificial sugar. I love that this infuser has a full-length infusing rod and it comes in multiple colors. It has great reviews and is a great price! Click here to get it on Amazon for $14.90! Track your drinking and infuse your water! The best of both worlds. This bottle comes with two different length infusers and it comes with an ebook of infused water recipes. Click here to get it on Amazon for $16.99! Of course Amazon is FULL of different bottle options but these bottles were highly rated/reviewed and I LOVE the first bottle. What kind of water drinker are you? Do you struggle with your water intake? Have a different bottle you love? Leave comments in the comment section =).